Juan Cole over at Informed Comment explains it best. The one point I would like to add however is that explosives as incredibly powerful as those used in Sundays carnage are not easily available. When a conventional explosion of this size occurs you have to wonder if there is governmental involvement. Since it was a Sunni attack against the Shia dominated ministries this point the finger at Syrian or even Saudi involvement. As for the Baghdad Provincial government (it is both a province and a city), it has been dominated since the January, 2009, provincial elections by the State of Law coalition of Prime Minister Nuri al-Maliki, the leading element of which is the Shiite Islamic Mission Party (Da'wa). So if the guerrillas who set these bombs were trying to kill party cadres attached to ministries, you'd have to conclude they were trying to kill those of the ruling Shiite religious parties, and also to take revenge on the new regime for the Ministry of Justice's executions of Baathists and Sunnis. North Sea: Four Luftwaffe planes are shot down when they attack a British convoy. No damage was caused to the convoy. Western Front: The French and German armies exchange artillery fire along the border. Everybody is unsure as to what the next step in this war is. 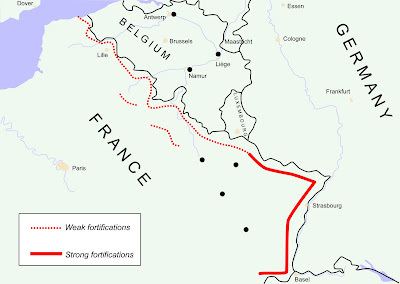 On this day the British have finished plugging the gap in the French Maginot Line which only goes as far as the Ardennes forest and does not protect Belgium. The French decision to put its trust in the Maginot line would prove to be one of the greatest military blunders in all history. The French thought that this war would be fought like the First World War and that the army that was best dug in would be in the strongest position. They therefore built the most elaborate form of trench ever conceived. The only problem was it did not go all the way to the coast and in any case modern warfare had changed so much during the interwar period with the development of the armoured tank and the aircraft that trench warfare and the Maginot line had become largely ineffective as the French would find out in spectacular fashion the following Spring. As of this day there are 110 British and French divisions dug in behind the Maginot line. None of them have seen any action yet. There were joyous scenes at Baldonnell airport late Sunday night as the government jet landed with freed Goal worker Sharon Commins. Great news indeed and I thought it was particularly poignant to see an emotional Goal boss John O'Shea there. My sister worked for him in Kosovo and she always said how he was obsessed with the safety of his volunteers. And you could tell by listening to him on the radio over the last three months as he tried to keep Sharon's abduction on the agenda that he was traumatised by the whole episode. Minister for Foreign Affairs Micheal Martin played a blinder throughout the whole event and is probably the only cabinet minister with any sort of popularity right now. Even though I didn't like his enthusiastic gratitude toward the genocidal Sudanese government as they probably sanctioned the kidnapping in the first place. But if providing them with some positive press was the price for Sharon's release then it was worth it. Watch her homecoming below. Australia: Australian Prime Minister Robert Menzies introduces compulsory military training. Britain: The war office recommends that soldiers at the front read both Mein Kampf and the Communist Manifesto. In the meantime all is quiet on the western front. 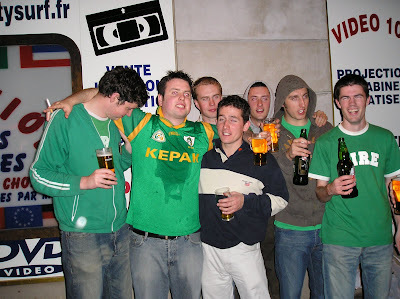 35,000 Irish fans cram into the Stad de France in October 2004, "you're supposed to be at home"
So its France. On Saturday November 14th Ireland will play Les Bleus in Croke park. The following Wednesday we will play the 2006 world cup finalists in the Stade de France. The winner takes all. I don't mind that its France. They have had a bad tournament so far and immediately on hearing the result of the draw in Zurich yesterday Irish memories went back to the famous 2004 game in Paris when 35,000 Irish fans took over the Stade de France. I was at that game. I intend on being there again on the 18th for what I hope will be one of the most memorable occasions in Irish sporting history. I got nostalgic after hearing the draw yesterday and decided to root out some of my photos from the 2004 game. Below is a sample of the best. Ireland, a nation of 4 million people equaled the number of French fans on their home patch. And we were emphatically more vocal than them. Poland: A Jewish ghetto is established in Lublin, the centre of Jewish "reserve" in Eastern Poland. Germany: The army high command issues Fall Gelb (plan yellow) the strategy for a western offensive. Ankara: The British and French governments sign a mutual assistance pact with Turkey. Irish aid worker Sharon Commins was released from captivity yesterday after 106 days in captivity in Sudan's Darfur region. Although it appears the Goal worker and her Ugandan colleague were kidnapped by a criminal gang demanding a ransom I have no doubt there is a connection between the abduction and the warrant issued against Sudanese President Omar al Bashir by the International criminal Court in Den Hague in March of this year. The arrest warrant led to a wave of kidnappings of westerners in Sudan. These were clearly government sanctioned and a blatant Bashir tactic to retaliate against western signatories of the ICC. The fact that the two were released without a ransom being paid as Minister for Foreign Affairs Micheal Martin insisted today adds weight to the theory that the government in Khartoum were really pulling the strings on this one. Why else would a criminal gang release their hostages without a ransom unless they were made do so by their masters. The main thing is that the two were released unharmed although reports are emerging today that they were mistreated and subjected to mock executions. We will know more in the next few days. The government jet has been sent out to Khartoum to bring the Dublin woman back home. She arrives back tonight. Edinburgh Scotland: A dozen German bombers attempt to bomb British warships docked at Firth of Forth near Edinburgh. RAF Spitfires confront the Luftwaffe and shoot down two of the raiders before chasing the rest away. Four ships are damaged in the attack the most serious of which was the destroyer Mohawk. This is generally regarded as the first Luftwaffe attack of the UK mainland in the war. Germany: Warships are ordered to torpedo allied merchant shipping without warning. After a long hiatus my Greatest War Movies countdown is back and this time I'm going Irish with Ken Loache's unique film about the war of independence. Starring Cillian Murphy and Liam Cunningham this 2006 movies is unusually brilliant. Deliberately low budget the entire cast of this movie except for Murphy and Cunningham consist of amateur actors who regularly fluff their lines giving the dialogue a sense of authenticity. 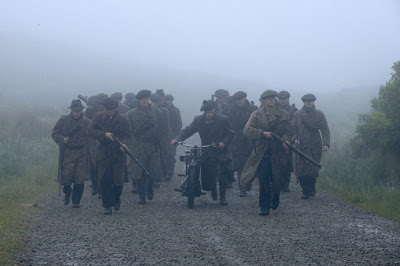 Set in West Cork the accents are very real (which anyone who has ever been there can attest to) and this adds to the whole sense of being there which is more powerful than in any other movie I have ever seen. There have been lots of movies made about this era. And after watching all of them I always think afterward what a great time it was and how I would have loved to have lived through it. The powerful realism of The Wind That Shakes the Barley shatters that illusion. It was an awful time of murder and mayhem and the decisions and choices that had to be made as always in war were horrific. The first time I watched this film I remember thinking afterward how glad I was that I did not live through that time. While I can see the romanticism in fighting the Black n'Tans its not so easy when it comes to what to do with a suspected spy or knowing when its time to put down the guns. Watch the opening scene of the hurling match followed by the violent attack by the Black N'Tans. Other films about this topic have been made from the top down. In other words they feature the prominent personalities of the day. In this movie there is no Michael Collins or Eamon De Valera. All scenes are from the view of the local column and how they operate in their independent and isolated manner. In this sense it is less historical and more about the challenges of living through the war. Again this adds to its convincing style. My only complaint is that I fear it is incomprehensible for non Irish audience (I'm not talking about the accents). The Irish Civil War that followed the struggle for independence was unique in that there were no ethnic of ideological differences between the two sides. It was simply a war between those who accepted the post war agreement and those who did not. In order to make it more understandable or perhaps more attractive to a wider audience Loach appears to have attempted to make it look like a struggle between right and left. This might be easier for a wider audience to understand as most modern civil wars as in Russia, Spain, Finland, Greece were all fights to the death between fascists and communists. We see this in the movie as Dan the trade unionist from Dublin tries to convince some of the volunteers that the capitalist IRA men will just replace the British and continue to oppress the working class. There may have been many leftist who felt this way but it is highly unlikely that they would take up arms against the new state in an alliance with ultra nationalist whose fanatic desire to fight on was not based on any leftist ideology but on an all or nothing philosophy when it came to an independent 32 county republic. This I know to be historically true. The Irish Citizen army, James Connoly's crowd, did not like the Anglo Irish Treaty but they did not fight against it. Unlike De veleras Sinn Fein they took their seats as the labour party in the new Free State parliament and formed the constitutional opposition to the government. I'm only making this point because I don't want people to think that the Irish Civil war was a left versus right fight. Proof of this can be seen in the political legacy of the civil war which created two main parties not of the left and right but of the center. Both these parties today are ideologically indistinguishable. None of this is to say that the movie distorts history but it is an important point to make. In any case the clip below will explain better in what is simply the best political debate ever seen in a movie. Estonia: The government signs a treaty to return Estonians of German origin to the Reich. This is clearly happening as part of the Nazi Soviet pact in which the Baltic states of Latvia, Lithuania and Estonia were absorbed into the Soviet Union. Finland: Compulsory national service is introduced in preparation for war with the Soviet Union which now seems inevitable. 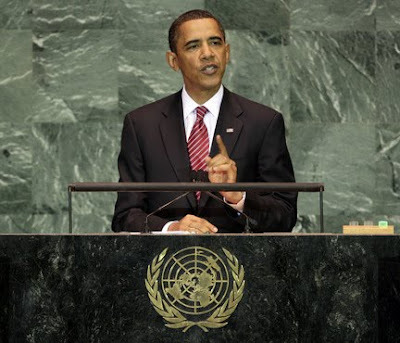 Another issue I missed last week was the Nobel Peace Prize being awarded to President Obama. I had just come out of an exam when my sister phoned me to ask how I got on. She then told me that President Obama had been awarded the Nobel Peace Prize. I reacted the same way as I imagine most people did, "for what". I couldn't believe it. Ok he sent George Mitchell over to the Middle East after his first week in office, this was good. He abandoned the missile defence system in Eastern Europe which as I recently explained here is a good thing. But otherwise he has done nothing. Its hardly enough to merit the prize by itself. Teddy Roosevelt got it in 1906 for negotiating the truce to the war between Russia and Japan. Woodrow Wilson was awarded the prize in 1919 for his peace making efforts at the Treaty of Versailles. Many are now arguing that to award Obama the prize a mere eight months into his presidency is to cheapen the significance of the award itself. I like Obama but I have to sympathise here with those on the right in the US that claim his popularity in the media and abroad appears to be almost unconditional. 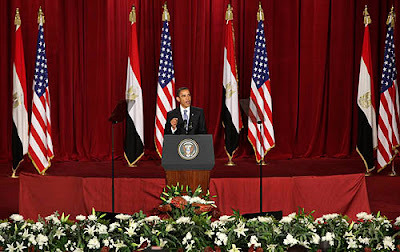 Obamas address to the Muslim world in Cairo last June I think that awarding the prize to Obama was an attempt by those in Oslo to put pressure on Obama to follow through with his rhetoric about a new era of global cooperation as well as his reaching out to the Muslim world policy. I simply can't imagine why else he was awarded the prize. 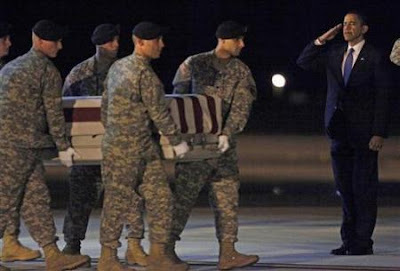 I any event Obama will have to make real progress in the areas of the Arab Israeli peace process, disarming Iran peacefully and reducing the nuclear stock piles if he is to counter concerns among his base at home and his fans around the world that he has still not closed Guantanamo, ended the war in Iraq and has expanded the war in Afghanistan. Scapa Flow, Scotland: A German U-Boat (U47) made its way into the British Naval Base at Scapa Flow under the cover of darkness and struck at 1am sinking the great WW1 era battleship the HMS Royal Oak. 414 of its crew are saved but 810 perish. Washington DC: Well known isolationist and famous aviator Colonel Charles Lindbergh was criticised severely on this day by many in Washington for his criticism of Canada's involvement in the war. In his comments he questions Canada's right to "draw this hemisphere into a European war because they prefer the crown of England to American independence". Moscow: Russia refuses to consider Finnish counter proposals for a land exchange on their borders. A war between the Soviet Union and Finland is beginning to look inevitable. Britain: The 1940 edition of Who's Who magazine is published on this day. Controversy is caused because the paragraph dedicated to Hitler contains four more lines than that on Chamberlain. Its clear the phony war continues. In my absence last month I never got the opportunity to comment on Obama's decision to abandon the Missile Defence Shield in Poland and the Czech Republic. I posted on this issue last year here where I exposed how fraudulent the whole thing was. Now Obama's many critics have been claiming it is appeasement 1938 style. A weak white house has sold two loyal allies out to the Russian bear. He has given up the missiles in exchange for nothing to the detriment of US national security. He has emboldened Americas enemies and isolated their allies. What utter and total and complete unmitigated horseshit ! Firstly Obama most certainly did get something back from the deal. The Russians have agreed not to place missiles in the Russian enclave of Kalingrad, which they have been threatening to do ever since the Bush administration decided to go ahead with the defence system. For some reason the American media have completely ignored this fact. Secondly the Russians have agreed to cooperate more with western efforts to hit Iran with tougher sanctions in an effort to get them to abandon their nuclear ambitions. To what extent they are willing to do so remains to be seen and will depend to a large extent on Obamas own ability to be a no nonsense negotiator with Moscow. The most annoying aspect with this whole thing is the analogy that America has sold the Czech and the Poles out to appease the Russians. The Poles and the Czechs never wanted this system. When it was first put out there they both emphatically rejected it. It was only when a counter offer was made which included tens of billions of Euros investment in both the Czech and Polish armed forces that the deal seemed sweet enough for them to contemplate saying yes. And even at that the deal had still not got past the Czech parliament and the Poles were looking for more money by the time Bush had left office. Now I'm no expert but I though that if you protect someone then they should be paying you for that protection. Not in this case it would seem. Here the Americans were attempting to protect Europe from an attack by Iran from long range but conventional missiles and in response America was to reward the Czech Republic and Poland for allowing America to protect them by giving them Billions or Euro in military aid. To put it simply, the Americans under the Bush Administration wanted this, not the Poles or the Czechs. So I am glad Obama got rid of it. It will hopefully free the Obama administration up to deal with real threats. 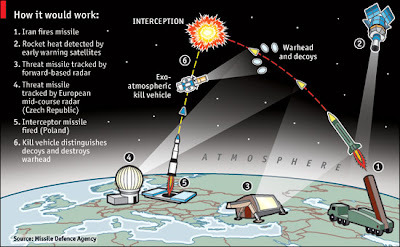 If the Europeans are worried that Iran might fire scuds and them then let them build their own missile defence system. I thought American conservatives were supposed to be against big government spending. But just not it would seem against spending billions of dollars protecting and ally that then seeks a bribe in for your protection. Bletchley, London: The only incident of note that appears to have happened on this date during the war was that two trains collided during a blackout killing three people in the town of Bletchley near Milton Keynes in North greater London. After the fall of Poland this period of the war became known as the phony war as clashes between the great powers were limited to skirmishes at sea and in the air. It wasn't so phony for those involved in the brutal war between the Soviet Union and Finland not to mention the ongoing horrors of the Japanese occupation of Eastern China. 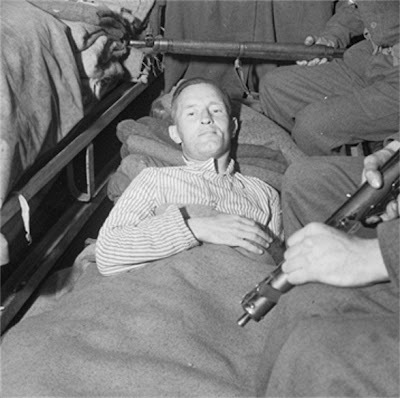 The "Phony War" period would last until April 1940 when the Nazis invaded Denmark and Norway. 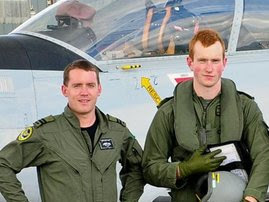 The two Air Corp members killed in yesterdays plane crash on the Galway Mayo border were named as 32 year old Captain Derek Furniss and Cadet David Jevens, 22. May they rest in peace. 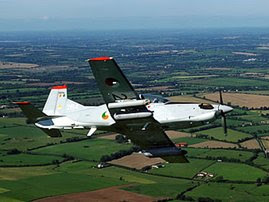 The Pilatus PC-9 light aircraft (below) crashed while on a training mission with two other aircraft that landed safely at Galway Airport. The cause of the crash is unknown but the bomb disposal squad are at the scene which suggests to me that they suspect explosives on board might have malfunctioned. Helsinki: The Soviet Union makes its official demand for an exchange of territory with Finland as an offshoot to the Nazi Soviet pact. This would lead to a vicious war to be fought between the two in the winter of 1939/40 in what is one of the wars forgotten theatres. 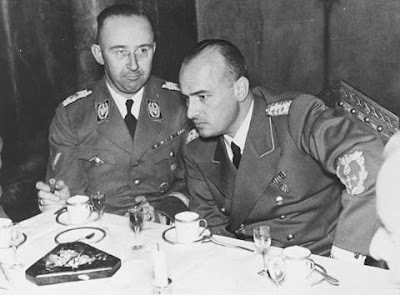 Krakow Poland: Hitler appoints the Nazi lawyer Hans frank to head the new administration for German occupied Poland now renamed the "General Government". Europe: Adolf Eichmann begins deporting Jews from Austria and Czechoslovakia into occupied Poland. 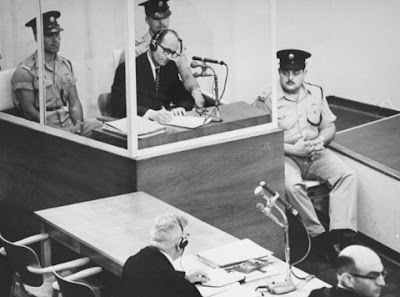 This is of course the same Eichmann that would escape Germany after the war only to be tracked down by the Israelis in 1960 who found him hiding out in Argentina. They brought him back to Jerusalem where he met justice by the hang mans rope. Don't pannick I'm back ! Right, I'm back. Finished my exams on Friday and spent the weekend partying. I saw Ireland almost beat the world champions at Croke Park but the sneaky Italians stole and equaliser in the 90th minute. Around the world its been hectic. Ireland finally ratified the Lisbon Treaty leaving only the Czechs as the last EU country still to do so. President Obama has abandoned American plans to build a Missile Defence Shield in Poland and the Czech republic. What was the pay off, if anything ? The Iranian nuclear crisis which has been ongoing since 2002 appears to be coming to a head at last as a second nuclear facility has been exposed in the city of Qom. General McChyrstal has requested 40,000 extra US troops to fight the Taliban in Afghanistan where NATO appears to be taking a beating. This has sparked off a fierce debate in America as to what the next appropriate step is in the country that proved to be a graveyard for the British and Soviet empires. And Barack Obama has won the Nobel Peace prize for nobody knows what. I am working on posts for all of these issues right now. Also I want to rap up my favourite war movie countdown. I'm down to my sixth. People have been complaining at my lack of Vietnam movies. True I have always been a World War Two man but there will be at least one in there from Nam. 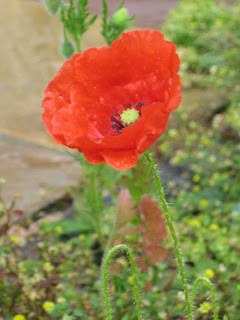 In addition it was the 70th anniversary of the outbreak of the second World War last month. To commemorate I am beginning a new series of posts entitled 70 Years Ago Today followed by the date. It will consist of brief daily posts containing information about the events of the day 70 years ago. In theory I should be doing this every day up until the the 2nd of September 2015, the 70th anniversary of the Japanese surrender. I'm starting a month late but sure what ya gonna do. I hope you find it interesting. Its often the little things that illustrate what life was like during the war that really illustrate how mad it was to live through a time when the world was blowing itself to bits.